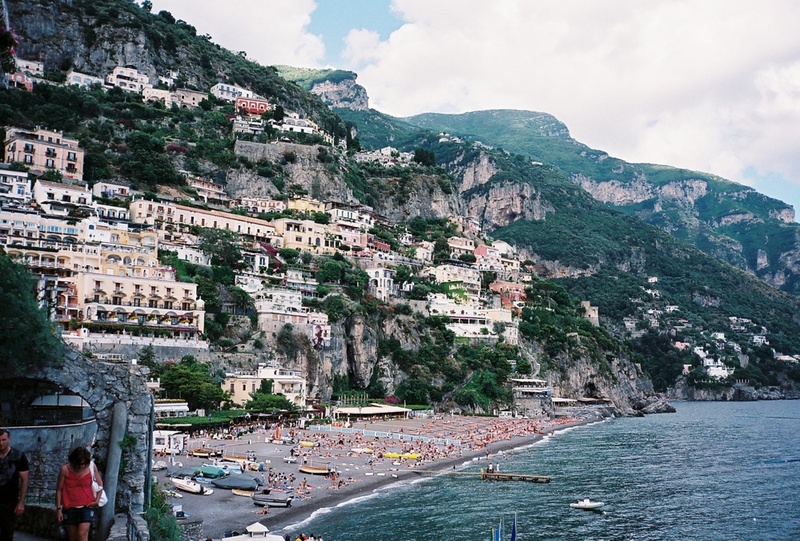 The mountains on the Amalfi Coast rise right up out of the sea, and the towns are built into them, terraced and layered in the stone. Stairsteps and lanes wind between stone walls and everywhere there is a patch of ground, someone is carefully growing something – fruit and olive trees, bougainvillea, tomato and aubergine plants, basil and wild fennel. So many lemons. This Mediterranean variety was long and lumpy and big as grapefruit. We met a local limoncello maker who was cutting off the peels to soak in vodka. “Dulche” he said about the sweet peels. I bit into the juice and zing of the lemon sections themselves. All was yellow and sunshine, pure lemon-ness. Everything we saw growing we’d also see on the plate. On most menus there’d be a some kind of rustic, handmade pasta. Sometimes it was a fat spaghetti, other times it was twisted into tight curls. In Pogerola, a small town high above Amalfi, we walked by the open kitchen window of an osteria named Rispoli and could see the steam rising. 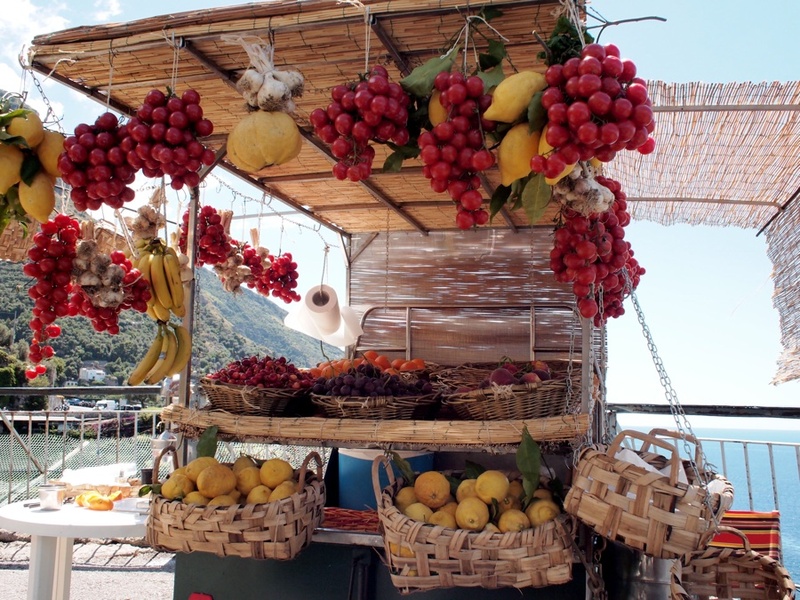 Across the narrow lane was a patio of 6 or 8 tables, and there – at a square table with a pink plaid tablecloth and views of the hillsides above Amalfi, Atranti and the sea – we ate plates of fresh mozzarella and tomatoes, a whole panfish with lemon, and pasta vongole with those tiny Mediterranean clams that are so full of flavor in their ridged purple-white shells. For dessert – we’d started to talk with guests beside us from Switzerland, so wanted to stay on longer – we shared a cold and creamy rum baba with wild strawberries. On other tables I saw plates of sardines and olive oil, and of fried squid and prawns, of pitchers of a beer-golden wine. One wiry sister, Marina, waited on guests and called out orders through the kitchen window to another sister at the stove. The pasta was yellow with yolk and roughly cut into wide, flat pieces, as if it had been hand-rolled and cut it with a knife. 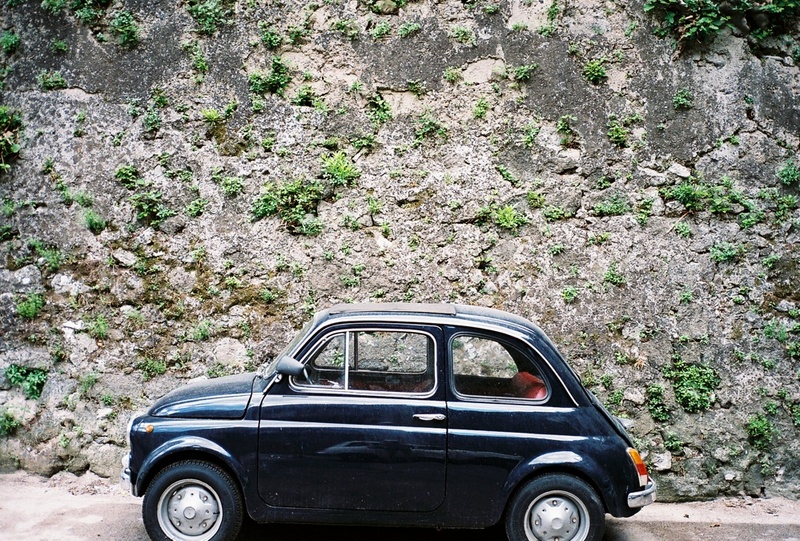 Bravissimo. And Rispoli had no wine list but a choice of bianco or russo served in glass pitchers for four Euros per litre. Oddly frizzante and almost foamy at first, their bianco tasted better and better as we drank into the night, and eventually walked happily back down the hill to our hotel. There’d been a ruckus in the yard that morning, John Duckworth said when I drove up. A neighbor’s dog had carried off one of his flock of young chickens and feathers flew, but the hen survived. A black-plumed rooster was still nervously scurrying between the 100-year-old farmhouse and the barn-sized building that’s now an art studio. Duckworth wasn’t unsettled though, and stood patiently watching the yard. He offered to brew some tea. Where a writer writes, where a painter paints – these are important places. Duckworth’s is a lofty studio, with oversized canvases set on easels and hung from wheeled tracks that allow paintings to be slid into and out of view. On another wall, there are computers with the broad screens needed for the digital aspects of his photography. (When we walked in, his assistant was mapping the effect of slight color variations on a specific print.) The studio building itself is a rustic compilation of found materials – walls of reclaimed beadboard and wide pine, of rough stucco-covered brick, and a mix of striated and smooth cement blocks. The artist hasn’t renovated to hide or replace any of these mismatched elements, all of which he says existed when he bought the place a few years earlier. Rather, he tells visitors what he’s learned about the origin of the materials – specifics about bricks from a South of Broad tear-down, or planks from an island barn. A few dozen yards away, Duckworth’s white-painted, tin-roofed house of porches, wood floors and single-paned windows is pure early-20th century rural South. There’s no television inside. Instead, there’s framed art on the walls (his and others), a well-used fireplace, and a spare amount of wood furniture. On tables, sills and countertops, there are found bones, feathers, and shed cicada bodies – a goldfish in a bowl, two tiny frogs in a terrarium cube. That morning there were also glass jars of moths and butterflies at various stages of development – a collection of cocoons and caterpillars that he’d been observing with his 5-year-old son, Baze, and then labeling the jars with notes about each insect’s diet and what to expect when it transforms and takes wing. The artist and single father is California-born, but has obviously found a comfortable place on this sea island so near to downtown Charleston, South Carolina. He used to rent an apartment in the 300-year-old city and often still makes the peninsula a subject or backdrop of his art. 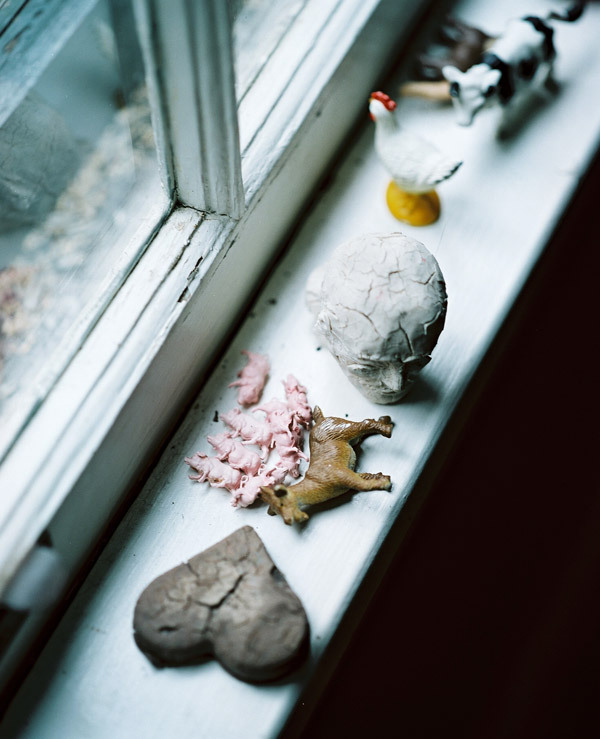 Duckworth paints and photographs the landscape, people, animals and elements around him. Wood fires in his firepit last winter led to photographs of wispy smoke that look like sheer fabric blowing. 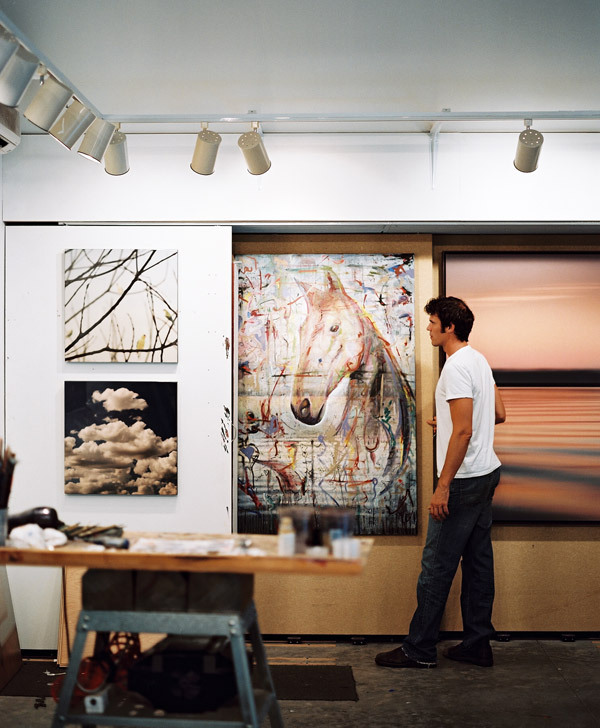 Horse farm visits with Baze inspired the artist to create a series of horse portraits painted over landscape photographs. And Duckworth still shoots and prints photographs of the marsh expanses, a passion born of bicycling on Johns and Wadmalaw islands and being struck by the beauty, color and peace of the wide landscape. He explains that he’s continually experimenting and blending these passions for photography and painting – studying the masters, mixing old techniques with new. After final looks at some of this island artist’s current projects, I’m back in the car and ready to drive off from this visit, when a sudden mid-day rainfall erupts. Big drops sheer the windshield, and I think of the built and natural scenes that are so often Duckworth’s subjects – paintings and images almost always out of clear focus. Viewing his art, I think, as I pull away from the island farm, can be like looking through rain on glass.